We’d love your help. 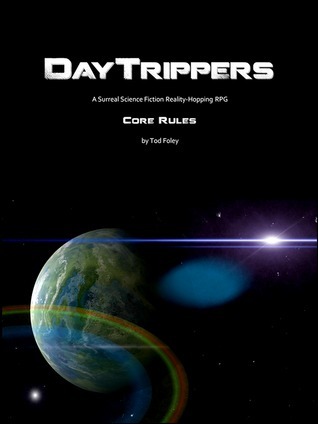 Let us know what’s wrong with this preview of DayTrippers Core Rules by Tod Foley. DayTrippers is a roleplaying game set in a surrealistic science-fiction multiversal milieu, in which an assortment of colorful character classes pilot unique machines into divergent universes to retrieve items of value and bring them back home. The setting was inspired by the surrealistic fiction of Moebius, Moorcock, Rucker, Heinlein and other masters of weirdness. The sys DayTrippers is a roleplaying game set in a surrealistic science-fiction multiversal milieu, in which an assortment of colorful character classes pilot unique machines into divergent universes to retrieve items of value and bring them back home. The setting was inspired by the surrealistic fiction of Moebius, Moorcock, Rucker, Heinlein and other masters of weirdness. The system uses d6s only. Character generation is point-based, actions are skill-based, and experience points are used to buy advancements of all types. Sample characters and vehicles are included. The Action Resolution system is both numeric and interpretive, creating a wide range of dramatic outcomes for every roll. To ask other readers questions about DayTrippers Core Rules, please sign up. DayTrippers is my roleplaying homage to the weird multidimensional works of Moebius, Moorcock, Rucker, Heinlein and other masters of weirdness. It fuses ironic postmodern surrealism with the wide-eyed innocence of the old-time pulp sci-fi magazines like Amazing Stories and Astounding Science Fiction.